Sofas add a definite charm to the living room. And it can be safely said that sofas are one of the most used pieces of furniture in the house. Whether it’s TV time with family, entertaining guests, or playtime for kids and pets, sofas provide us the much needed comfort. However, because of constant use, sofas and other upholstered furniture become reservoirs of dirt, dust, contaminants and allergens. Regular maintenance is essential to keep them clean and thus ensure your family’s well-being. Over a period of time, sofas gather all kinds of contaminants, including dust, dirt and food particles. Spots, spills and excreted body oils can, over time, detract from the furniture’s original beauty. Moreover, accumulated dust also degrades the fabric colors. Regular vacuuming at home can only clean the surface of the sofa. And nooks and crannies are hard to clean without expert help. Leaving them unattended can cause the sofas to look dirty, not to mention health risks associated due to germs and mold that is allowed to breed. Common health effects are nose, throat and eye irritation, skin irritation or rashes. Sofas come in a range of materials and fabric like cotton, silk, leather or suede. Our team of experts is trained to handle these with utmost care. The first step of our sofa cleaning services is to identify the fabric and make of the sofa and accordingly select the most suitable method. With a combination of years of experience, expertise and specially formulated cleaning solutions, your sofas will look clean and new in no time. Regular professional sofa cleaning has been proven to create a cleaner, healthier environment at home. Antimicrobial treatments for your sofas also result in improved resistance to dry soil, water or water-based stains and daily wear and tear. Professional cleaning not only removes the obvious soils but brightens and restores the soft feel and fresh smell. iCleanCarpet Singapore will help you design a plan that fits your requirement, budget and schedule. 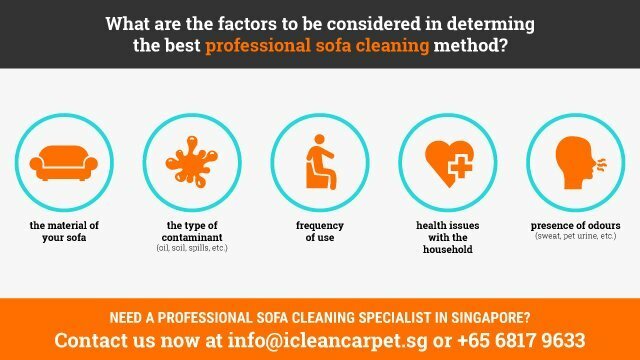 Contact iCleanCarpet for the best and affordable professional sofa cleaning services in Singapore! service, call iCleanCarpet now at 68417 9633!